Viewtainer storage containers are the answer to your home organization needs. What makes these clear plastic containers so great is that they are completely spill-proof and the clear walls makes it easy for you to see the contents of each container with just a quick glance. They have literally thousands of uses including office supplies, pet supplies, and arts and crafts. Crafters love to store paintbrushes, buttons, beads, yarn, and more in these clear containers. An assortment of sizes and colors are available to suit your various needs. 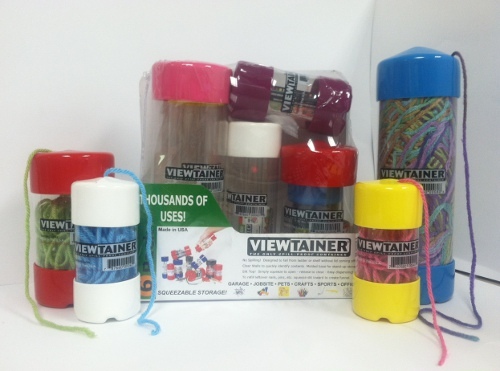 If you've been looking for a more organized way to store your yarn scraps, these Viewtainers are just the thing. The clear walls make it super easy and quick to identify your yarn, and there are various sizes to choose from depending on how much yarn you have leftover. The largest size is even big enough to store an entire full skein of yarn if you want! These containers have been specially designed to fall from a shelf without the lid coming off (especially convenient if you're storing loose items such as buttons and beads), and the molded base allows for stand-up storage, which is a huge space saver. Simply squeeze to open them, and the slit top allows instant access to the contents of your container. Pulling yarn out of these containers is effortless; it's a great way to keep your yarn scraps tangle free.